The average professional has about 30-100 projects on their plate at any given time! It’s no wonder we are so stressed out at work and looking for relief. Work stress can lead to overeating, panic attacks, loss of sleep and so many other health problems–all of which affect our work and home life. 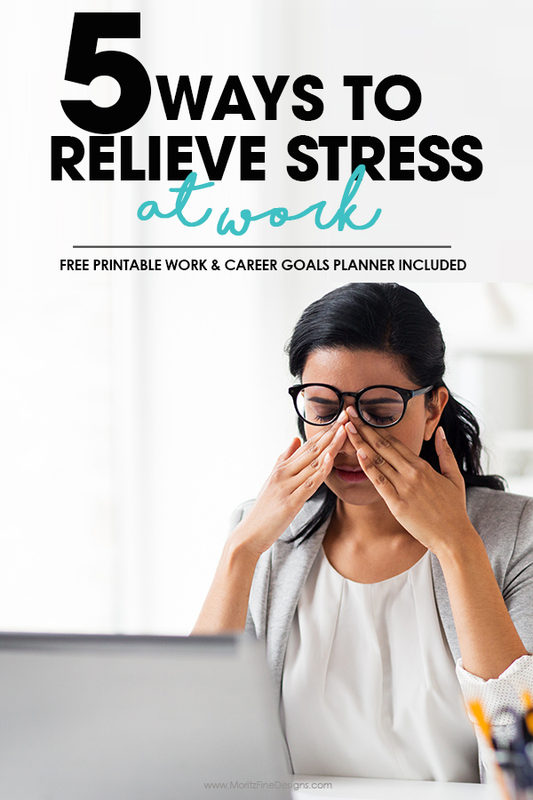 Are you ready to relieve some of that work stress? If so, use these top tips to help you reduce some of that stress! If you are feeling short of breath or just a little overwhelmed, take a moment to stop and take a deep breath. Clear your head, and breathe. Deep breathing can help you calm down when you’re short on time and help you relax just a little. My favorite little tip is for those of you who have an Apple Watch, make sure you have the “Breath” app enabled! It taps you once a day to remind you to stop and breath deep for 1 minute! Don’t ignore it! You feel so much better after 1 minute of slowing down. Keeping up with our work to do list can be a little overwhelming. Most of us are juggling multiple projects and deadlines at the same time, so trying to keep track of everything can be difficult. We feel like day in and day out we are running a rat race that never ends. Ultimately, we would all like to get further in our current jobs as well as in our careers. We need a starting point and that starting point is to take time to evaluate our current job and future career goals. 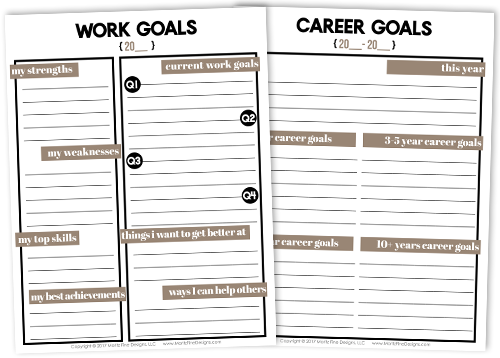 Use my Work & Career Goal Setting Printable (you can download it at the bottom of this post) to get you started. Many of us are guilty of bringing work home with us! Whether we are working off the clock at home after hours, or can’t seem to turn off our emails, many of us struggle with a work-life balance. This can be even more difficult for those working remotely. Set your work hours, whether your job dictates that or not, and don’t do anything work-related unless it’s within those hours. While there may be times when you need to go to work early, or stay late, when you leave the work building it’s time to leave work at work. Most jobs have vacation or time off built into our work schedule for the year, and while they are usually paid days off, many employees don’t take them! Despite having the time to take off, many won’t all of their given vacation days due to being too busy at work. Over time, this can start to impact you as an employee negatively. Even if you don’t go anywhere, use your vacation time to enjoy a little “self-care” time. Not taking time off for yourself can lead to feeling overwhelmed at work, and even impact your work performance. Not getting enough sleep can be one of the main reasons you are feeling stressed at work. If you aren’t taking care of your body, you are forcing it to work overtime to play catch up. Trying to handle your workload, and keep yourself awake, is probably more than your brain is ready to handle for the day. This leads to frustration and stress, making it difficult to focus on work. While working late and staying late might make you look better to your boss, it won’t do you any good if you aren’t at your best the next morning. Make sure you are getting 7-8 hours of sleep every night. Be sure to turn off the electronics (tv, phone, email, etc.) at least 30 minutes before lights out! Try diffusing a little Peace & Calming Essential Oil and read a book for a few minutes. Make this a habit and you won’t believe how quickly you fall asleep each and every night! Work can cause us a lot of stress, but that doesn’t mean that we are helpless to our work stress. Start simple and try two or three of the above tips to help relieve stress at work, and get yourself back on track!